Happy New Year! This week’s article is part two of a two-part Supply and Demand series that began before Christmas. You can find Part 1 by clicking HERE. 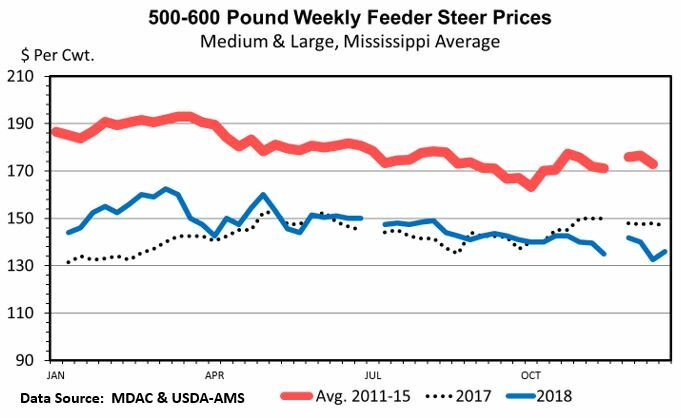 While the larger supplies discussed in Part 1 will remain the biggest headwind to stronger prices in 2019, strong domestic and international demand for U.S. beef is continuing to provide price support. A strong domestic economy is supporting beef demand despite the larger supplies of beef and also larger supplies of other proteins chicken and pork. Domestic beef consumption per person in 2018 was about 57 pounds and is forecasted to grow another half-pound in 2019. This increased consumption occurred at similar to higher beef prices than a year ago. U.S. restaurant performance was also strong in 2018 with indicators suggesting an expanding restaurant industry most of the year. While domestic demand can be classified as strong, international demand for U.S. beef has been superb. Internationally, robust exports have supported the demand profile for beef and, therefore, cattle. Beef exports have risen by over 20 percent over the past 2 years which has helped absorb some of the beef production increases. This includes an estimated 11 percent increase in 2018. Japan remains our largest export partner, but exports to South Korea have increased rapidly to claim the 2nd spot. Beef exports to South Korea are up 40 percent year-over-year based on the latest trade data. Overall, more modest export growth is forecasted for 2019, but it is worth noting that the modest forecasts the past two years have been sharply exceeded. Beef demand has been and continues to be excellent which is providing some cattle price strength despite larger supplies. The past few years have been a demand-driven environment where stronger-than-expected beef demand has led to stronger-than-expected calf and yearling prices. The past few years have been important transition years that coped with the sharp supply increases. The slower herd growth numbers begin to paint a brighter price picture for 2019 and 2020 if domestic demand and exports continue to grow.